Dorband & Associates’ primary mission is to empower eco-entrepreneurs (ecopreneurs) to dream, plan, strategize and create new businesses. Over the years we have worked together with many ecopreneurs to accomplish this mission. A number of these businesses are thriving today and are completely independent from D&A. At any given point in time we are working together with 10-20 ventures as they begin their journey as planet friendly enterprises. Find below a list of those that we are working with today. Some are already companies and some are initiatives within companies. This list changes often, so come back and visit this page to see what we are doing today. EAT is a special project of IoE and D&A that is on a mission to scale up environmental education through various online and offline partnerships. The EAT Community and EAT online platform are evolving rapidly, but our team is working hard to publish webinars, high quality online courses, in depth case studies, and blog articles about topics including: ecological aquaculture, aquaponics, controlled environment agriculture (CEA), land, water, and energy management, permaculture, sustainable design, and alternative health concepts. Research and development in the area of indoor sustainable agriculture and small acreage farming and ranching. Teaching as doer/teachers where we walk the walk instead of talking the talk. We are doer/teachers who believe we have to have done something to teach about. So, we have designed and built a number of different sustainable agriculture systems and programs. Collecting and disseminating as much information as we can gather about sustainable agriculture around the world. We are passionate about making a revolutionary change in the way that people think about food production and feeding themselves. WorldWide Aquaculture, LLC, (WWA) is a wholly owned subsidiary of D&A that provides consulting and partnering opportunities to the international aquaculture marketplace. WWA is dedicated to promoting and supporting sustainable aquaculture solutions. We work as principals in the industry as well as consultants. However, even when our role is as a consultant we bring to projects a principal/owner’s attitude and philosophy. Development and operation of a urban indoor sustainable agriculture business in the Minneapolis/St. Paul, MN area. Construction and operation of a commercial community scale marine shrimp farm in North Canton, Ohio. Technical direction with construction and operations of a large scale commercial aquaponics project near Ft. Collins, CO.
Construction and oversight of a community scale indoor agriculture project in north central Mexico. Construction and operations oversight of a proof of concept sustainable indoor agriculture project for Fort McMurray, Canada, located in the heart of the oil sands boom area of the north. Go to our WorldWide Aquaculture website to get more specific information about how we might be able to work together. 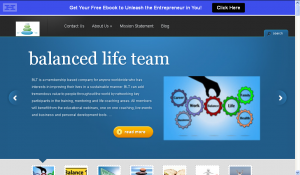 Balanced Life Team (BLT) is a membership based company for anyone worldwide who has interests in improving their lives in a sustainable manner. BLT can add tremendous value to people throughout the world by networking key participants in the training, mentoring and life coaching areas. All members will benefit from the educational webinars, one-on-one coaching, live events and business and personal development tools. The life coaching and training industry is fragmented. There are mainly independent entities with few large corporations and even fewer public corporations, without a clear industry leader. These numerous small players have typical “brick and mortar” overhead and flaws that Balanced Life Team will capitalize on. As an online network of industry leaders we will tap into various sources for valuable membership benefits while maintaining a virtual platform with low overhead, minimal employees, and lucrative and industry leading member privileges. World-class information about balancing your life. Exclusive access to industry professionals providing services to improve lives. Easy access to a community/tribe of people with similar interests. Proven lead generation methods and tools for you to use to improve financially. Products and services members can use to improve their lives and even sell themselves to make money. All of these benefits and more will be available for reasonable cost structuring with world-class quality and service. 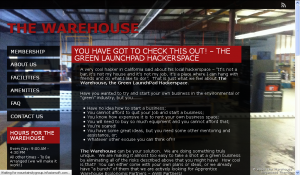 The Warehouse – a Green LaunchPad Hackerspace, is Dorband & Associates’s Hackerspace in Berthoud, CO. It is a unique Hackerspace that emphasizes sustainable living and lifestyles. We believe it is the first in the country. As one hacker in California stated, “it is not my home, not my job and not a bar, but is a place where I can hang with people I like and build things I like”. Very cool, huh!! This site can be found at our Northern Colorado location. 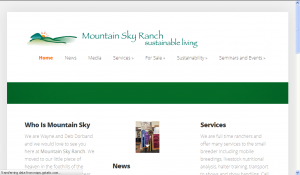 Mountain Sky Ranch (the Ranch) is operated by Wayne and Deb Dorband and Dorband & Associates as a commercial breeding, show and genetics sustainable agriculture operation. The Ranch is also managed as a research, education and demonstration campus for sustainable agriculture. Frequent agritourism-related events and workshops are held at the Ranch. Visitors are welcome! Our location in an isolated valley at the foot of the Rocky Mountains is idyllic in its beauty and grandeur. Visit our Mountain Sky Ranch website to find out about future events and activities at the Ranch. Come and visit us; we know you will enjoy it! What do Alpacas have to do with sustainability? Great question. Alpacas are truly earth-friendly animals. They are incredibly easy on pastures because they do not eat down to the grass growth zone. Their poop is a ready-made, rich fertilizer that does not have to be treated at all to be directly placed in a garden or on a pasture. They are native to the Andes in South America, so they have a wide temperature tolerance and require very little food and water. Finally, their fine fleeces are harvested (shorn) every year up until they reach their upper teens in age. There is enough value in several years of fleece to sometimes pay for the animals’ purchase price. Wayne and Deb operate Mountain Sky Alpacas as a premier breeding/showing/genetics herd. We are currently greatly expanding our business through three new and unique programs. 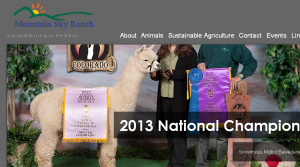 Mountain Sky Alpacas is offering a special professional handling service to small farms and ranches to give those farms an affordable ability to show their outstanding animals across the country when otherwise they may not be able to. We will be traveling to a 10-15 show circuit throughout the country with ours and clients’ animals. We are excited to announce a Rocky Mountain Region Drive By Stud Service with over a dozen outstanding herdsire boys at an incredibly affordable price that, again, will be greatly beneficial for small farms who want to incrementally improve their herd genetics. We believe we have the most diverse elite breeding herd in the Rocky Mountain region. Finally, saving the best for last, we are offering a Fractional Alpaca Share Team (FAST) program to allow people to obtain quality alpaca ownership without many of the issues of normal ownership programs. This PacaShare program will make fractional units of quality breeding females along with an incredible array of services available for purchase. We have fit our alpaca business into the entire sustainable philosophy of Dorband & Associates and we would love to share more about it with you. 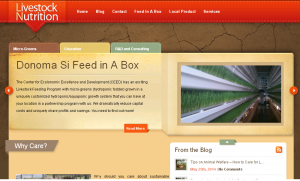 Donoma Si Feed in A Box: The Center for Ecolonomic Excellence and Development (CEED) has an exciting Livestock Feeding Program with micro-greens (hydroponic fodder) grown in a uniquely customized hydroponic/aquaponic growth system that you can have at your location in a partnership program with us. We dramatically reduce capital costs and uniquely share profits and savings. You need to find out more! 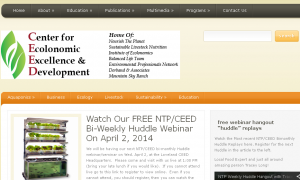 Dorband & Associates is privileged to be able to be closely associated with the Institute of Ecolonomics. D&A shares office and space with IOE, is a committed financial supporter, and provides administrative services to IOE. The two companies share the vision of the synergy between ecology and economy. IOE’s mission is to provide business development and incubation services to “green” entrepreneurs who have ideas, concepts, inventions or technologies that will make the planet a better place to live. D&A heartily supports this mission with our money and our actions. Dorband & Associates is always looking for visionary business ideas to improve sustainability in its business areas. Mountain Sky Ranch has a historic sandstone quarry. We were first excited about it because it creates a huge amphitheater that we will eventually use as an event center. Wayne also enjoys using its solid vertical walls for a climbing venue. But guess what, our whole ranch site is underlain with this beautiful, valuable sandstone rock. And, better yet, you can actually quarry this stone using earth friendly techniques and create a locally produced building product that is ecolonomic in its value. Well, we did not believe this at first, and it took an amazing young man, John “Doc” Holiday to show us the ecolonomic value of this natural sandstone resource. With John as the guide, we helped form Colorado Sandstone Quarries, LLC (CSQ) that now operates an earth-friendly stone “farming” business at Mountain Sky Ranch. The quarry is now being operated by Matt Spraque from the pioneering quarrying Sprague family. Matt has over 20 years of quarrying experience. You have to come out and see this operation to see is beauty and sustainability. You can take a little stone home with you, too, if you would like. 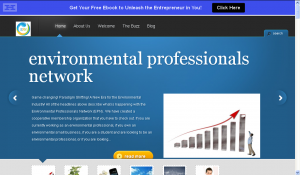 In early 2014, D&A became one of the Founding Members of the Environmental Professionals Network (“EPN”). We are changing the way the environmental industry operates. EPN is a membership company providing unique services to environmental professionals and aspiring environmental professionals. Watch for the growth of EPN in the near future. In May of 2014, EPN entered into an exciting relationship to revolutionize the way that environmental businesses and professionals handle the workforce to enhance their businesses and increase their profitability. Watch for more info on this exciting new relationship. D&A is proud to be in a partnership relationship with this exciting venture in the Caribbean. Located in the Dominican Republic, our friends, Peter and Natasha, have created an amazing center where people can come to learn about how to live in a close relationship with the planet in an ecolonomic manner. 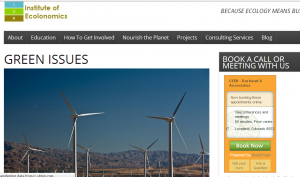 D&A serves as advisors and instructors for courses and programs offered at the Ecocenter. 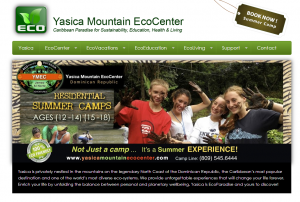 Check them out at their website at www.yesicamountainecocenter.com.